I'm signed up for Tri Boulder at Sprint distance next weekend. I've not raced it before, although the Sunrise and Sunset races from last year are pretty much the same course. I did 1:41/1:42 respectively for those. I'm a lot less prepared that I'd like, but as optimistic as ever. I've not been able to swim since the end of May. Early May I slipped and grazed the skin off the front of the scar on my right leg. I covered it up, sprayed it with Nuskin but with the Chlorine in the pool etc. It didn't heal. Then I had a small amount of skin necrosis and it just didn't heal. Given I have no health insurance and wasn't prepared to pay as much as $6,000 to get it treated, as qouted by one woundcare center. I've been following advice, dug out the dead cells, and have been alternating a couple of creams and covering it. It's been making good progress and I'll decide on Saturday if I'm going to do the full race, or skip the swim. Otherwise, after Sierra to the Sea my bike should be OK, I have the opportunity to do a couple more rides before the race. After a slow start, my running is coming back into focus. After 90-mins on the bike yesterday I was able to do a 9:42 mile and a reasonable 31-minute 5k. It's a long way from where I'd like to be, but as I get older I'm getting used to this as the new norm'. Which was the point of this post. 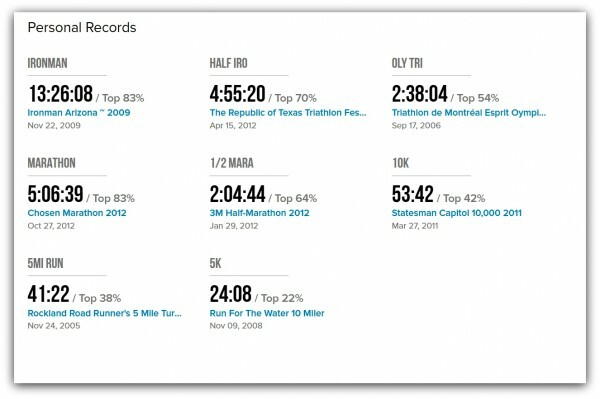 The new Athlinks UI has an easy way to pull all your PR/PB's together, here are mine. Staggeringly I have 177 races in the athlinks results database. For the remainder of the year, I'm planning on racing the Sunset Tri at Olympic Distance, and then 5430 Harvest Moon at either Sprint or Half, and maybe Without Limits Oktoberfest Sprint. We are also entered in to the Denver 5k in September.